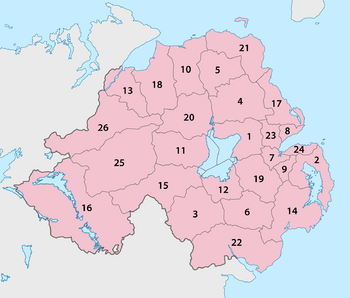 Since 1 October 1973, Northern Ireland is made of 26 districts. Each district has a council which looks after local services. The 26 districts are made of 582 wards. Each ward elects 1 councillor. There 582 councillors in Northern Ireland and there is an election every 4 years. The voting system used to elect each councillor is Single Transferable Vote. Some of the councils are known as "Borough" or "City" councils. Every year, each council elects a chairman. In "Borough" and "City" councils, the chairman is called the Mayor. In Belfast City Council, the chairman is called the Lord Mayor. In "Borough" and "City" councils, up to 25% of councillors are given the title Alderman. Districts of Northern Ireland Facts for Kids. Kiddle Encyclopedia.